Engage and reward your customers. Drive in-store traffic, increase revenue. Interactive innovative marketing at your fingertips. Set up a new loyalty program or extend your existing loyalty program taking advantage of the mobile channel. 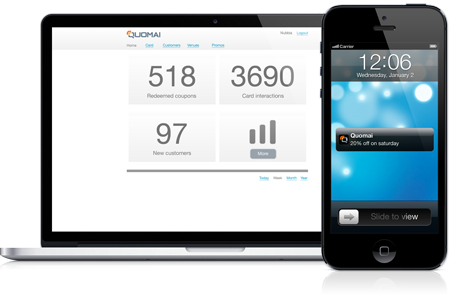 Customers will join your loyalty program on their smartphones through Quomai mobile app. Send offers and mobile coupons to your customers’ phones to get foot traffic to your store. Track coupon redemption on real time. Get customer feedback and improve your service. Manage your loyalty program and rewards. Track promotional campaign redemption. Get valuable feedback for your sales growth. Do you want to go mobile?